Ouch! Once you get a cold sore blister, odds are quite high that it will recur in the same spot over and over again for the rest of your life, sometimes up to a dozen times a year. Known as herpes labialis, it is caused by the same kind of virus that causes genital herpes. 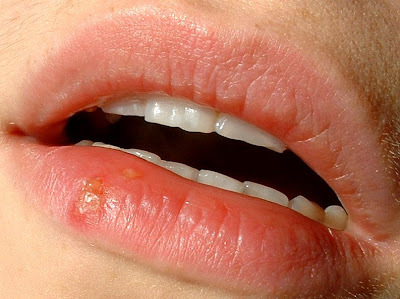 Up to 75% of adults by age 50 have been exposed to the causative organism, herpes simplex, although many never develop a cold sore. It is spread by direct contact, even when there is not a blister present. Common triggers include stress, fever, menses, sunlight, trauma and heat or cold. These triggers activate the dormant virus in a nerve, causing a burning, itching or tingling sensation to initially develop. About 1 to 2 days later a blister forms, which can last up to 3 to 4 weeks. Although there is currently no cure that can permanently treat herpes labialis, antiviral medication such as Zovirax or Valtrex taken within 48 hours of the initial symptoms can shorten the duration and lessen the severity of the outbreak. Lysine, an amino acid, has been commonly used with varying amounts of success for the same purpose. People who have 4 or more outbreaks a year can decrease attack frequency and severity by taking a low, daily dose of a prescription antiviral. Decreasing stress on the body by proper nutrition and getting adequate sleep can also help decrease attacks, as can protecting the lips with sunblock or Chapstick during weather extremes. Read here for more information on another variant of the virus, herpes zoster, that causes singles.